Egeldish is a language I worked on throughout 2013 and through the beginning of 2014. It’s rather kitchen-sinky, but is far more complex and interesting than my earlier languages. This improvement is, I think I can pretty safely say, mostly due to listening extensively to Conlangery. Egeldish is spoken in – surprise! – Egeld. Though it has a fairly simple phonology, it’s very agglutinative and inflects for almost everything languages often do, as well as a few things languages don’t often do. That being said, I think I did a fairly decent job using all that morphology in interesting ways and extending its uses creatively. While I was working on Egeldish, I spent a lot of time thinking about how people would use it and abuse it in normal, colloquial speech. So when I was more or less finished with my grammar notes and ready to translate an example text, I thought it would be fun to translate a casual conversation and try out all those colloquial structures I had put in Egeldish. Now, I could have written a conversation, but I thought it would be more fun to actually record my family talking and then translate something from our conversations. And, of course, any real conversation would be more natural than something I had written! So I recorded my family talking one breakfast (with their permission, yes), picked one bit of a conversation, edited it some so that it would make sense in Egeld (because, for instance, Egeldish would not be talking about relatives in Knoxville), and then translated it. This translation project was quite fun (even if I was driven occasionally to complain to my sister, “Why, oh why did you have to use THAT sentence construction? !”), and it did give me a good opportunity to try out a lot of Egeldish’s structures. For instance, I chose a conversation where we were talking about our dreams, since Egeldish is actually very finicky about marking things that don’t exist or only sort of exist, like dreams, and so it was neat to figure out how Egeldish marks such stuff. I even got to use the names I gave to the letters of the Egeldish alphabet at the end, where Juhārgene spells out a name! But I’m glad to be done. Egeldish was a fun language to create, but it has a lot of problems. It’s humongous, and kitchen-sinky, and inconsistent, and wild, and just plain unwieldy. I’m looking forward to working on my next language, Arandui, which is going to be a lot more streamlined. (Though I bet in another year I’ll be complaining about Arandui and saying how terrible it is.) So understand as you look at this text that while this is the best language I’ve created to date, I know it has a lot of problems! Here I have the original conversation my family had, as I transcribed it from my recording, just with certain personal information taken out; my modified, Egeld-compatible version; my translation into Egeldish; and finally an interlinear and literal translation with various notes and commentary on how Egelish does things. Alison (to Mommy): Look how curly Catherine’s hair is! Mommy: It’s beautiful after she washes it. Alison (laughing): That sounds familiar! Alison: – and a man came in with like these five dogs, and at first I thought he was [our friend], but then I realized no, this is his brother. What he was doing with all those dogs I don’t know! And why we were in [the nearby country] I don’t know. You know, it’s like, anyways! But what I just – what I just – what I dreamed about the Series of Unfortunate Events was that – I’m not sure if I was reading, or if I was actually, like, being this. But, so, Violet and Klaus and Sunny were going to this, like, some kind of charity orphanage place, but it was only for, like, younger children, and you could, like, leave a child there, and you would promise that you would leave the child there for, like, forever or something but then they would would like take care of her for free. So they were like thinking about, um, having Sunny there, so that she would be safe, because for some reason they thought she would be safe there. So they went to the orphanage, and it was all sad, and dramatic, because they were giving her up so she could be taken care of. And then, they were just going out, and suddenly Klaus was like, “OH MY GOSH! I just had this, like, premonition that something terrible will happen if we leave her there! We need to go back and get her!” And I’m like, oh, dear, now the author is resorting to, um, supernatural feelings about the future? So they went back and got her. So – so – so, so like, what the books were like, they – First of all, they would not leave Sunny at a random orphanage! Secondly, they wouldn’t have, like, sudden visions of the future…So…but it was rather peculiar…. Daddy: Oh! Sonny is a girl? Alison: Yes. S *U* N N Y.
I imagine this as a translation of a transcript of a conversation in Egeldish recorded in early 1501, between the members of a middle-class Egeldish family living in Dāʔos in central Egeld: Nanaʔu, the father (replacing my dad); Dadaʔu, the mother (replacing my mom); Juhārgene, the older daughter (replacing me); and Enāne, the younger daughter (replacing my sister Catherine). I replaced the names of places in the real world with names of places in Egeld, replaced the names of real friends of ours with imaginary friends of the imaginary Egeldish family, and replaced the Series of Unfortunate Events references with references to an imaginary Egeldish book series. I’ve made up very little about this imaginary book series, by the way; all I know is that it’s about three orphaned Egeldish kids fleeing Azon at some point who happen to be the same ages and genders as the protagonists of the SoUE, because I didn’t want to change the original conversation too much. Also, a few other small things are tweaked to fit better with how Egeldish puts things. Juhārgene (to Dadaʔu): Look how curly Enāne’s hair is! Dadaʔu: It’s beautiful after she washes it. Juhārgene (laughing): That sounds familiar! Nanaʔu: Oh! Suŋe is a girl? Juhārgene: Yes. S U *N* E.
Juhārgene (to Dadaʔu): : Atohāāsēt nesināʔyijd hāja jērle Heenāne! Dadaʔu: Nega nwasinonsʔwēc golya uŋ. Nanaʔu: Ha! Čornya Suŋe, sya re? Juhārgene: Sya. Sēt an NĀN en. I dreamed the Books beside the Ŋunos’s weirdly again! Here you can see Egeldish’s adverb ending marker. If you have two or more adverbs, you have to mark the last one with the adverb ending suffix. The adverb ending marker is also used on any adverbs before the verb or after a bunch of other words. You can also see one of Egeldish’s case clitics, which come at the end of a whole noun phrase – I like the idea of having a case marker marking the whole noun phrase instead of just the head. And you can see a bit of Egeldish’s odd prepositional prefix use – here what literally means “beside” is used to indicate “the books about the Ŋunos’s”. Because of what have I been dreaming it? I dreamed – what did I dream? This is just a tiny peek at Egeldish’s crazy question formation system. There are many ways you can form questions in Egeldish, with all sorts of combinations of verb moods and irrealis and markings on nouns and on and on…I may post it someday, since I’m pretty happy with it, so let me know if you’re curious. Here’s an example of Egeldish to-be construction: to say “I am nerdy,” you’d basically start out with the sentence “Exists a nerdy me” (per Egeldish’s usual VSO word order), then front “nerdy” to get “Nerdy exists me.” The fronted adjective or noun has to be the one carrying the case clitic, so you end up with a adjective or noun with a case clitic, then the copula verb (which can be dropped in present tense), then the head, alone by itself with no case clitic. This bit also has the first example of Egeldish’s surrealis marking. I call it the surrealis because that sounds cool and because it acts much like the irrealis marking. It’s used for things that aren’t quite real, like dreams or visions, and to mark reported speech and thought (like “He thought she was a robot” or “He said she was a robot” not “He thought, ‘She’s a robot! '” or “He said, ‘She’s a robot!'”). When the head of a noun phrase is marked surrealis, all the adjectives need to be marked too. This fuss about surrealis marking is the main reason that the Egeldish is longer than the English in this example text, since the Egeldish needs to keep marking surrealis with fairly long affixes while the English goes its merry way without any such extra bits of stuff. Usually Egeldish is more concise than English because of all those kitchen-sink verb markings. One last note: The underlying morphemes in “some” here are cānt-jaʔ-eʔ, but if you look at the Egeldish above, you’ll see cāntčaʔeʔ. This is because Egeldish has a phonological rule that when a fricative, stop or affricate is next to another fricative, stop or affricate that has a different voicing, the second one assimilates to the voicing of the first. So [t] (unvoiced) next to [dʒ] (voiced) makes [dʒ] become [tʃ] (unvoiced). Anyways, I just happen to like that particular little rule. You could look at Enāne’s so-curly hair! Just as Egeldish has crazy question formation, Egeldish also has crazy command/suggestion formation. (This is partly because Egeldish culture focuses a lot on politeness and respect.) Here Juhārgene is being polite to her mother by using irrealis and potential/permissive marking as well as a polite pronoun. She fronts atohāāsēt “so curly” to show that she wants her mother to look at how curly Enāne’s hair is, not just look at her hair. By the way, hāāsē “curly” comes from the word for “circle,” which I kind of like. You may also notice that what’s underlyingly u-Enāne comes out as Heenāne – what?! This is since Egeldish absolutely detests vowels next to each other and so always messes with them if they happen to come together. In this case, the weird resultant form comes from the rule that in vowel clusters not preceded by a consonant, the lower vowel is replaced by [h] and the other vowel is lengthened. After she washes it, it’s beautiful. More formally, an Egeldish speaker wouldn’t drop the copula verb like Dadaʔu does in golya uŋ “it is beautiful” and mark conditional/resultative mood on it, but hey, this is colloquial speech. Also, here’s more of Egeldish messing with vowels trying to get next to each other. When two vowels cluster after a consonant, the first is deleted and the consonant is palatalized or rounded, depending on the vowel. So -ʔo-ē comes out as -ʔwē, while gole-a ends up as golya. As I mentioned earlier, adverbs can come after other words in the sentence, they just need to have the ending marker. So here we have “We were like visiting some people, probably in Crāā…” and since the “probably in Crāā” comes after “some people,” it needs the adverb ending marker. But notice that Enāne needs to use another verb in order to use an auxiliary verb. She couldn’t just say ŋiʔwocū čāgenecta; she also has to use what’s more or less a dummy anaphoric verb, ana, since auxiliary verbs must come right before normal verbs. So if you’re already into the rest of the sentence and you suddenly decide to add a bit of information that can only be expressed via auxiliary verb, you need to use a normal verb, too. And, like this, um, if I was remembering the people, we were seeing if that was the case. Here we have a nice example of Egeldish’s aversion to subordinate clauses. You can’t say “We were seeing if [I remembered the people].” You can’t say “I like [to eat spinach].” You have to make that would-be subordinate clause a separate, independent clause (marked with irrealis, though), and then refer back to it with “that.” (The animate form, oddly enough.) So you’d say something like “I IRR-eat spinach. I like that.” This tendency of Egeldish is really annoying, but I do kind of like it anyways. You can also see Egeldish’s relative aspect in this example, which acts a bit like an imperfective. When you mark relative aspect on a verb, the tense it’s in is relative to the main, non-relative verb in the discourse. So here in “We were seeing if I remembered the people,” “we were seeing” is past tense, and “if I remembered the people” is present tense with relative aspect, meaning that it happened at the same time as “we were seeing.” This, like the irrealis marking, is a trick of Egeldish’s to warn you that a verb clause, while independent, has a sort of subordinate discourse relationship, if you get what I mean; you know that there’s going to be some other more central verb somewhere with the reference tense. And if your brain feels melted after trying to understand that – forget it. It’s not that important. And it makes my brain melt, too. Another, simpler thing: You may notice that la “and” is marked “SIM,” or simultaneous. Most Egeldish conjunctions have two forms – one for when the following action happened at the same time as the action it’s linked to (simultaneous), and one for when the following action happened at a different time (sequential). This is an idea I stole from a random language whose name I forgot – I was looking at papers about irrealis marking and came across a language that did this, thought, “Cool!”, and put it in Egeldish. Here you can see another of Egeldish’s endless verb moods, the optative, and an instance of an irrealis prefix messing with vowels outside of itself. The underlying form here is “er-lanc-,” but that irrealis prefix er- doesn’t like vowels that are too low, so it changes the [a] in lanc- to [ɪ]. This is something that just a few particular affixes do; it’s not a universal phonological rule. But there are quite a lot of other little hints of vowel harmony developing in Egeldish – I could see a future version having full-fledged harmony, especially since Egeldish has an awful lot of vowels. By the way, you may wonder why this verb isn’t marked in surrealis. It would be usually, since it’s something that happened in a dream, but the optative mood forces irrealis, and irrealis blocks surrealis. So there you go. I like that word dāʔ. It means “familiar” in this context, but it generally means “similar to something else.” It can also mean “straight.” I can’t really remember my rationale for that connection between straightness and familiarity. But it is sort of interesting. Also, there’s some more fronting here. If Juhārgene didn’t front dāʔdat “similar, familiar,” she would more or less be saying, “I see a familiar thing!” But by fronting dāʔdat, she emphasizes that it’s the similarity she’s seeing. When I was writing my Egeldish grammar notes, I did mention that you could front anything so long as it carried a case clitic, but I didn’t think much about how it would be used. Then as I was working on this translation, I kept finding more and more places where it would be handy. Just goes to show how important translation is in the language creation process! This bit is really exciting, isn’t it? I dreamed – we met a younger brother in Lord Negānis, I dreamed that. Jalūsca, in case you’re wondering, is a town in northern Egeld. Juhārgene and co. are supposed to live in Dāʔos in central Egeld (and in case you’re wondering, yes, the dāʔ in Dāʔos means “straight” – the name means “straight river”), but they could have family or friends in Jalūsca; it’s quite common nowadays for Egeldish, especially more middle-class, educated Egeldish, to move around. You can see both Jalūsca and Dāʔos on my map of Egeld. 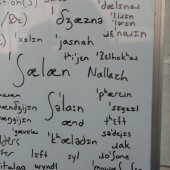 Note that to say “we were in Jalūsca,” Juhārgene has to use a verb meaning basically “be someplace,” any, but to say “we were with the Nodānos’s,” she uses the usual copula verb, ŋit. Also, “Rūdros” and “Nodānos” are both names of towns and last names. Egeldish people almost always use the name of their town (usually the town where they were born or grew up) as a last name, so Juhārgene’s full name is Juhārgene Dāʔos. The -os, by the way, means “river”; Dāʔos, as I mentioned earlier, means “straight river,” Rūdros means “bird river,” Ŋūnos (from that imaginary book series) means “white river,” and Nodānos…well, I can’t find “nodān” in my dictionary, so I’m not sure. Egeldish has no [m] sound, so this affirmative noise is usually written “nnn,” whether it’s a true [n] sound or not. Here’s an example of adverbs being put after other stuff – eðidrāntyujaʔn zdātčaʔe “with five seakitties” comes after “man.” So it needs to be marked with the adverb ending marker -e. Also, you may wonder why some verbs are being explicitly marked for past tense with -h, while some like jēʔson “come” aren’t marked. Well, the rule is that if suffixes go on the verb, it needs to be marked for past tense. But if there aren’t any suffixes, past tense is unmarked. Nonpast tense, on the other hand, always need to be explicitly marked. Finally, here you can see the sequential form of “and” – ēs. I almost always translate “and then” this way. Etanse, literally “with the whole,” is a metaphor for “at first.” It comes from the realm of food. The idea is, when you first get some food and make some judgment on it (like, “This looks yummy!”), you have the whole thing. It’s only after you’ve bitten into it and you don’t have the whole thing that you can make a better judgment. Also, you’d usually use surrealis here on the copula ŋit, but Juhārgene is using tentative mood to say that this is what she thought, and tentative forces irrealis, and irrealis blocks surrealis. But then I realized: no, a younger brother in Hāč Negānis, this. Here Juhārgene uses the contrastive verb mood to emphasize her “BUT then…” Also, note that uriza “in him” (e.g., his) is not marked surrealis. When Mr. Negānis was mentioned just a bit earlier, when Juhārgene said she thought the man who came in was him, he was marked surrealis. Now he isn’t. Why? Because Mr. Negānis is not inside the dream anymore – he’s just connected to it since this imaginary guy is supposedly his brother. So his connection to the dream is marked surrealis – zēlywujaʔn “younger brother” is marked surrealis. But Mr. Negānis is not. He and all those seakitties did what – I don’t know! This sentence still melts my brain if I think too much about it. That verb tarca is a question word much like “what” – you say what’s basically “You tarca?” to ask “You did what?” But here it’s combined with the dubitative mood (formed with negation, irrealis, mood negation and tentative mood, remember) to mean “I don’t know what he did.” The antipassive is thrown in there because, as I’ll explain later, Egeldish has some weird ambitransitivity stuff going on. Also, forgive the weird parentheses there that are showing an infix. I would use the usual carets, but that breaks the plugin I’m using for interlinears. We did what in Jalūsca – I don’t know! Another brain-melting sentence pretty much the same as the one above. Since there’s nothing in particular new to note, I might as well explain the ambitransitivity business. So, Egeldish has two classes of verbs: the catalytic verbs and the noncatalytic verbs. Catalytic verbs generally have a distinct endpoint, and may also have a distinct result and/or effect. They involve a change in state within the time frame looked at, and are usually telic. Noncatalytic verbs generally have no distinct beginning or end and can expand freely in time, are generally atelic, and usually don’t have a distinct effect. Verbs of perception (see), sensation (feel), position (sit), cognition (think), emotion (love), relation (be part of) and weather (rain) are mostly noncatalytic. Every Egeldish verb is either intrinsically catalytic or intrinsically noncatalytic. (In certain contexts they can change, but let’s ignore that for now.) Now, most Egeldish verbs are also ambitransitive, but whether the subject of an intransitive sentence is like the subject of a transitive one with that same verb (S=A) or like the object of a transitive one with that same verb (S=P) depends on the catalyticy of the verb. Catalytic verbs usually have S=P intransitives. Noncatalytic verbs usually have S=A intransitives. Some examples: ŋo “eat” is catalytic. If you said ŋo ðidrāð dētet, literally “ate seakitty fretoriod,” it would mean “the seakitty ate the fretoriod.” But if you said ŋo dētet, literally “ate fretoriod,” it would mean “the fretoriod got eaten.” So with a catalytic verb, if you have an intransitive sentence, the subject is like the object of a transitive sentence. On the other hand, rēs “think” is noncatalytic. If you said rēs ðidryan dētet, literally “thought seakitty fretoriod,” it would mean “the seakitty thought of the fretoriod.” But if you said rēs ðidryan, literally “thought seakitty,” it would mean “the seakitty thought.” And so with a noncatalytic verb, if you have an intransitive sentence, the subject is just like the subject of a transitive sentence. Now, tarca “do what?” is catalytic. So if you said, tarca ðidrāð dētet? it would mean “the seakitty did what to the fretoriod?” But if you said tarca dētet? it would mean “what got done to the fretoriod?” So in the two sentences where Juhārgene uses tarca, since she wants to say she doesn’t know what they were doing – not what was done to them – she must use an antipassive. What’s an antipassive? Well, let me just refer you to David J. Peterson’s awesome article on ergativity, and so if your brain isn’t melted already, like mine is, you can go investigate this further. Now. On to the next phrase in Juhārgene’s narrative. This part definitely exercised all the bits of discourse fluff that I had made up for Egeldish. I have to admit, it was kind of fun to translate, especially after slogging through those insane “I don’t know what we were doing…” sentences. The bit at the end, where Juhārgene is stumbling over her words, is another place where fronting became very useful. So there you have it. Egeldish’s catalyticy, morphosyntactic alignment and ambitransitivity system. It still confuses me sometimes, but I like it; I think it’s one of the better aspects (haha) of Egeldish. Though, I’m not sure I was reading, or, on earth, like this, I’m not sure I was existing. More fun with dubitative mood! Here soconðeyujaʔn “on earth” means “in reality.” This fits nicely with Egeldish philosophy, which has the sky being a symbol of emotions, dreams, visions, feelings, and all other mushy, not-quite real things, and the earth being a symbol of gritty reality and routine. Here’s another example of Egeldish’s relative aspect. “Walking” is being treated here like some sort of background event, something happening at the same time as some other action that will have past tense. Basically, you’re looking at the instance of “walking” from the perspective of that other action; the walking isn’t important enough to get looked at on its own. And also, I have to admit, I actually really like the names Ðēlne and Hāntis as replacements for Violet and Klaus. They fit somehow. Ðēlne [‘ðɛlni], “forest” with the female name suffix -ne (the same one you see in Juhārgene and Enāne), sounds quite pretty to me. And Hāntis [‘hæntɪs], which doesn’t have a meaning yet, fits too in an odd way. And then Sune is pronounced the same way as “Sunny,” but it works as an Egeldish girl’s name since it has that suffix -ne. Derandū, which I glossed as “charity,” has a much more complex meaning than just that. It actually comes from the name of a nearby country, Arandu, where there are very little taxes but people are required by law to give a certain percentage of their income to charity. It basically means “involving charitable giving of private, non-governmental donors; funded by individuals,” but it also has a certain connotation of the giving being done just to enhance your reputation, or make the lower classes like you more and be more willing to support you. Egeld and Arandu have always had a rather unpleasant relationship, which is part of the reason behind this negative connotation. But the fact is that Juhārgene is not trying to make the orphanage sound particularly bad or anything – that’s just the most fitting word she has to describe what it’s like. You know, I really don’t know what I was thinking, using the prepositional prefix ej- (which usually means “ahead, before”) for “for” (e.g. a benefactive) instead of an auxiliary verb. But it works, I guess, and I hate going back and changing things I’ve already translated. So I’ll leave it. Anyways, here you can also see some of Egeldish’s noun/adjective prefixes – there are quite a lot of them, mostly meaning things like “exactly,” “somewhat,” “very,” “kind of,” &c. They’re very common in colloquial speech; Juhārgene and co. have already used a few of them. If she were speaking more formally, she probably would have said “only” in a different way, but here speaking casually she puts on lots of “exactly” prefixes and gets her point across. Still irrealis, since we’re still in a hypothetical situation. But now it’s without the potential/permissive mood, since this is something you WOULD do, not just something that’s possible. Ah, here we have a peek at future tense in Egeldish! As you might expect, the verb is marked with nonpast tense, but it’s what else is marked that’s the difficult part. The fact is that what else you do depends on the catalyticy of the verb, whether this future event was intended or not, and whether the subject is first-person or not. With this noncatalytic, intended, non-third-person-subject event, we have it easy and just use the future particle lolʔ. But more pain is coming. Trust me. Also, I find it amusing that the word for “something or other, thingy, whatever it is,” gyēssyc, is rather difficult to pronounce by English standards: [gʲɛsːʲk]. But it does sound nice. but then they will care for her without money. This verb and the last one were marked with relative aspect, since they are being seen as relative to that act of promising. Also note that oneʔāsēdwya “without money” isn’t marked as an adverb – adjectives need to be specifically marked to become adverbs, but prepositional phrases can be used as adverbs by themselves. But of course, with both, you need to use the adverb ending marker in some places. You may have noticed that nonpast tense can be marked in two different ways: through a suffix, which changes a lot, and through vowel lengthening. Now, Egeldish vowels can already be lengthened through regular phonological processes if they’re stressed, so if the root’s last vowel is already lengthened, the suffix is used. But if the root’s last vowel isn’t lengthened, nonpast tense is shown by lengthening it. Because for some reason they thought that. Now here’s the other action that all these verbs in relative aspect are being considered in relation to: they thought she would be safe at the orphanage. That’s the whole point of their walking and considering and whatnot, so all that walking and considering is put in the background with relative aspect. I’m actually only realizing this now, as I write these notes, but it makes perfect sense. Isn’t that how language and linguistics often is? You say a sentence with perfect ease without thinking about it, and only once you’ve been staring at it for a while trying to analyze it do you realize what amazing SENSE its grammar makes, how astonishingly logical it was all that time, and you never realized it – it was just words coming out of your mouth. Awesome. I also like that word āneʔ, “reason for doing something.” It also means “stone.” The connection comes from how Egeldish people used to vote when meeting together in councils. They would discuss an issue and decide a few different options for how to deal with it, then get a big jar for each option. Each voter would then take a stone and make a mark on it to show it was theirs (so a carpenter might draw a nail, and a corn farmer might draw an ear of corn, or something like that – each person would have a unique mark), then put it into the jar for the option they wanted. If some people were still unhappy after the votes were counted and the most popular option found, the person running the council would take some stones out of the jars for the losing options and ask each person who had put them in, “What’s your reason for your vote?” Eventually stones and reasons came to be associated, and that’s where the word came from. Čāsčalon “dramatic” comes from the word čāsča, which means “spill” or, colloquially, “die.” But čāsčalon has a certain connotation to it of being overly dramatic and expressive, of tending to make things sound more important than they are, also of being overly sad. because for the purpose of the safety in her, they were giving her up. Remember how some things in Egeldish are possessed alienably, and some are possessed inalienably? Well, “safety” is one thing that you must possess inalienably, oddly enough. Also, this is one of the few sentences where you can actually see one of Egeldish’s free pronouns, nān. When I was writing my grammar notes, I spent a lot of time coming up with a complex system of free pronouns for Egeldish, forgetting that I was planning to also have marking on verbs that can usually replace pronouns. Oops. I remember translating “said” jēʔlī and then staring at it, going, “I must have forgotten something! The verb can’t be that simple! There must be SOMETHING else I need to mark on it!” But no. I had just been translating so many complex and tricky verbs that a simple one seemed wrong. Finally some more interesting stuff! First of all, there’s ligān dūrţ, which is an Egeldish expression of alarm or concern more or less equal in strength to “oh my God!” I haven’t actually come up with a meaning for this expression, however, preferring to let Egeldish swearing remain ambiguous. Secondly, note that Hāntis uses the word lanan to say that he had a premonition – the same word that Juhārgene and Enāne used to talk about their dreaming. This word lanan can mean “dream,” “see outside of yourself, see the general picture, realize something about the world,” “have a vision,” or, with a spirit or ghost as a subject, “visit the land of the living.” Now that I think about it, it would probably be used to talk about hallucination, too. Anyways, I find that interesting. Finally, there’s odlīna, “premonition.” I wanted to capture the sort of long, unusual flavor of the original English word in the Egeldish translation, so I decided that odlīna could be an older, more archaic word. And you know, now that I think about it, it’s rather fitting that Klaus’s replacement should be using unusual words! will happen something terrible if we leave her at that place! Here you can see Egeldish’s if/then structure. The condition (“if we leave her”) is just in irrealis; the result (“something terrible will happen”) is in irrealis with conditional/resultative mood. Also note that the adjective ajalos “terrible” is standing by itself – adjectives in Egeldish can be freely used as nouns, so if you want to say “a terrible thing,” you just use the word for “terrible” as if it were a noun. And while I’m already talking about ajalos, I like its fuller meaning: “terrible, uncontrollable, particularly horrible things out of reach; especially for natural disasters and terrible twists of fate.” Rather fitting for the characters in the original conversation. And, speaking of terrible things, I told you quite a while ago that the future tense gets more icky. Well, here’s one place it does – I had to use one of those insane auxiliaries, hhgi, and I had to negate it, too, since Hāntis and co. don’t intend for that terrible thing to happen. When I was first beginning to translate this, I thought I would come up with some other way to say “go back.” But the more I thought about it, the more it made sense to me that one would say “go back” to mean just that. So I stuck with it. Also, here Hāntis uses the necessitative mood, which is quite strong. He makes it a bit more polite by using irrealis, but it’s still quite a forceful construction to use with his sister. to supernatural feelings beside the future, yes no? This bit uses a more colloquial, nonstandard question formation strategy. Usually in Egeldish you use some weird combination of irrealis, interrogative mood, question markers on nouns, and other things to form questions, but sometimes when you’re quite sure of something and are just checking about it, or if you’re asking a particular kind of rhetorical question, you might just add sya re “yes no” at the end to make it a question. I suspect that Egeldish in the future probably would just have this question formation strategy, since the other ones are a pain. So they went back they got her. As you can see, no “and” is required here between “they went back” and “they got her.” In general, spoken Egeldish only uses conjunctions to connect distinctly separate clauses. That last bit, hotsta, is the beginning of another kind of to-be structure. It took me a long time to figure out a fragment that would make sense in both the English and the Egeldish, but I finally came up with this. Beside the first, they would not leave Sune at a random orphanage! Here we have a peek at Egeldish’s negation system, which is rather complex. This particular sort of negation requires both the verb and the subject to be negated. (Though if the object was more topical or more animate than the subject, it would be negated instead.) If, however, you were saying “They would not leave Sunny at a random orphanage,” implying that they would do something else with her at a random orphanage, you’d just negate the verb. Or if you wanted to say “They would not leave Sunny at a random orphanage,” but they would perhaps leave somebody else, you’d just negate “Sunny.” And on it goes. I do kind of like how neat and even it is, but then, I also like it when things are a bit crazy and irregular. Here are another two examples of the prepositional prefix for “beside” being used to mean “about.” We also have another instance of lanan being used to talk about having a vision. And we have a more normal word for “vision,” odlanan, instead of Hāntis’s more unusual odlīna. Nothing much to say here – a straightforward past-tense to-be structure, and a bit of filler. Though lāne also means “yellow” for no particular reason. Oh! Girl Suŋe, yes no? My idea here was that Nanaʔu misheard the name “Sune” and thought it was “Suŋe,” a boy’s name. Anyways, here you can again see the more colloquial question construction. And yes, I find it rather amusing too that the Egeldish for “oh!” (when it’s surprise, not concern; for concern you’d use “hyēē!”) is “ha!”. But it makes sense! Yes. S U *N* E.
And here, in the final bit, I was happy to be able to use the names for the Egeldish letters – names that I had made up several months before, thinking that they’d never be useful. I have developed a whole Egeldish alphabet using symbols that are also used in certain Native American syllabaries, so that I can actually type it on a computer without making my own font. I might eventually type up this whole conversation in the Egeldish alphabet, but for now I’m glad to be done with the translation, and glad to be done with this whole write-up, too! So there you go, that’s a peek at Egeldish and all its unwieldy, kitchen-sinky, wild, but still rather awesome craziness. Hope you enjoyed! For a short introduction to the Egeldish language, see this page. Let’s just start off by saying that Egeldish has a lot of pronouns, but then, Egeldish generally has a lot of everything. First of all, there is a set of inanimate pronouns, which is comparatively small, and a set of animate pronouns, which is rather large. The inanimate pronouns include a second-person set, oddly enough – many Sheesanian linguists have tried to explain those by saying that Egeldish often personify inanimate objects and speak to them (which is, I admit, true). Then there are the animate pronouns. There are three sets of animate pronouns: normal, polite and extra-polite (though the extra-polite ones are falling out of use), with male/female gender in the third person. All the Egeldish third-person pronouns also have separate proximite and distal forms. The proximite forms are used for objects/people/&c close to the speaker, while the distal forms are used for objects/people/&c far away from the speaker. This distinction is also used sometimes to show discourse relevance and help distinguish between multiple 3rd-person referents. Why do the 3rd-person pronouns have this distinction? They developed from Egeldish’s demonstratives, which have similar distinctions. With plural 3rd-person forms, a group of mixed gender is referred to with the male pronoun, and with 3rd-person animate things that don’t have gender, or don’t have obvious gender (say, a bug? ), the male form is used. Sexist, I know, but typical of natural languages. Originally, there was a distinct inanimate pronominal plural affix, -ho, and an inanimate pronominal associative plural affix, -ots. These have gotten melted onto the pronouns with time, however. As with the inanimate pronouns, there was originally a pronominal plural affix, -he, and a pronominal associative plural affix, -nu, which have again gotten fused on with time. The normal pronouns are generally only used with peers and subordinates – even if a speaker of Egeldish is very close with a superior like a parent or a teacher, s/he would still use polite pronouns. However, these normal pronouns are also used for people who haven’t really gotten fitted into the social hierarchy yet – for instance, if you see a random guy on the street and need to refer to him, you’d use a normal pronoun. Unless he’s significantly older than you, or he’s dressed much more nicely than you, or it’s clear some other way that he would probably be above you in the social hierarchy. The 1st-person forms are derived from “this child,” čorznye, and the 2nd-person forms are derived from “lord,” hāč. The 3rd-person female forms are derived from the female form of “lord,” hāčne, and the 3rd-person male forms are derived from the male form of “lord,” hāčis. Note that the 3rd-person polite forms show deference to the person you’re talking about, not necessarily deference to the person you’re talking to. So if you’re talking to your friend Hāntis and you use a polite pronoun to refer to your friend Golene, you’re showing respect for Golene, not for Hāntis. On the other hand, when you use a 1st-person polite form, you show respect to the person you’re talking to, not respect for yourself. These polite pronouns are used with superiors, usually even with quite high superiors, and also sometimes with peers or even with subordinates if you’re asking a favor or otherwise humbling yourself in some way. Books, radio stations, movies, etc. address their readers, listeners, watchers, etc. with these polite pronouns, but occasionally you might come across a book or something with a very colloquial tone that might use the normal pronouns to address the reader/watcher/whatever, however. The 1st-person forms are derived from dūr, a word with an unknown original meaning; the 2nd-person forms are derived from elār, another word with an unknown meaning; and the 3rd-person forms come from elār plus the masculine/feminine -is/-ne endings. The only time these extra-polite pronouns are used seriously is when you’re talking about or talking to somebody very important, like a king or prime minister, who you really respect. They used to be far more common, but over time they’ve acquired a certain sarcastic tone. So you more often see them in the mouth of an Egeldish speaker mocking somebody in authority or somebody acting high-and-mighty. They are most often used to refer to unpopular politicians or leaders of unfriendly countries. However, they are slowly falling more and more out of use, and they’ll probably be more or less gone from Egeldish in another few generations.